I have a multi-level worm composting bin and about a month ago noticed that the number of mites in the bin was starting to get out of hand. Normally, mites in the bin are not a problem as they are not a threat to the worms and they help to break down some of the materials that worms might not. They just eat up most of the food which starves the worms. So I decided to try using Spooky Remote to see if it would help with the mite infestation. I used a piece of the medical tape to pick up a few of the little critters, folded the tape over so it was sealed, put it in the remote, and chose all the programs in the “Evironmental Preset” that contained the word “mites”. I set it to run repeatedly and left it for 3 days. This was on a Sunday. I came back on Wednesday and while not all the mites were gone, there was maybe 5-10% of the original amount left in my bin which is a safe number to work with. 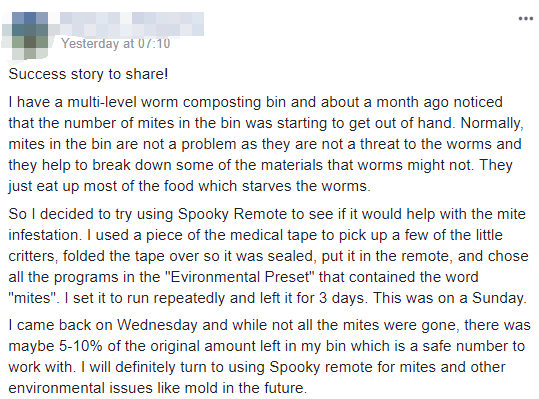 I will definitely turn to using Spooky remote for mites and other environmental issues like mold in the future.